A man believed to be in his early 20s was found with stab wounds in Cunningham Place, near Regent’s Park, at 18:15 GMT, and died in hospital. A spokeswoman said officers continued to hunt for the suspects who had “fled the scene”. “The police just surrounded them. I saw that at around 19:00,” he added. Mr Moulana said a woman told him she saw “two guys” enter the building. “Someone else told me the police were chasing them,” he added. Mr Moulana, 39, said it gave him the “jitters” to see armed police at the scene, especially following the recent attack at two mosques in New Zealand. 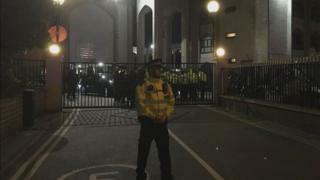 A police cordon has been put in place at the mosque, with officers seen flanking parts of the building’s perimeter as a helicopter circled overhead.